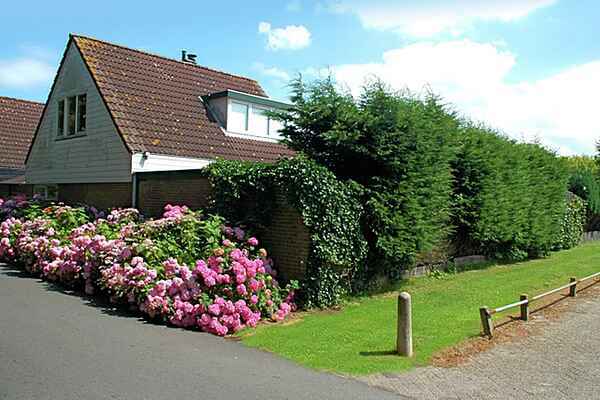 This stylish bungalow is in a park, within walking distance of the dunes, forest and beach of South Holland's Noordwijkerhout. The sheltered garden of the house offers plenty of privacy and the various seating areas are an ideal place to enjoy the sunshine. On the ground floor of the holiday home, you will find a comfortable living room with a seating area where you can watch TV. Everything is very cozy and tastefully decorated; you will immediately feel at home. There is also a dining table where you can pleasantly dine and socialize with your company. The area is ideal for hiking and cycling. It is extremely beautiful here in the spring when the world famous Flower bulb Region is in bloom. From the house, you can walk to the recreational lake where you can find a swimming beach. You can eat or drink something here and you can even rent a boat. The park has plenty of playgrounds for children, a small supermarket, a restaurant, tennis courts and a bicycle rental. Towns and attractions nearby, such as Haarlem, Leiden, Keukenhof and Space Expo are well worth a vist and are easily accessible For golfers, it is close to the Tespelduyn public golf course .